Happy New Year, loves! 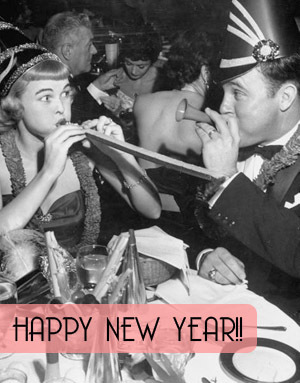 Was your final night of 2011 filled with champagne, sparkly dresses, and merriment? I hope so! Confession: I spent last night in pajamas watching Disney movies. Don't despair. It was wonderful. I was surrounded by family whom I don't see enough, my homemade brownies, and tons of laughter. A delightful way to ring in 2012, if I do say so myself. As always, however, a new year brings a certain amount of introspection. Regrets from the departing year or hopes for the coming one tend to marinate in one's mind. Normally, I'm not one for New Year's resolutions. I can be a bit hyper-rational, so it's always seemed a bit strange to make goals on the same day every year. One can accomplish something just as well starting on September 22nd as January 1st, after all. Yet, this year feels different. 2012 just sounds promising, doesn't it? I'm a bit giddy at all the possibilities that this year might bring. It makes me want to help things along. Elsewhere on the web, Shivani (from the lovely blog, Pins & Needles) referenced the idea of New Year's Intentions. I quite like that. Intentions sound less threatening than resolutions, don't you think? They're things you want to do, but won't make you feel like an utter failure if a few fall away. To that end, I've made a list of my sewing intentions for this year. These are mostly little goals I've been ruminating on for awhile, regarding where I see both my sewing and this blog going. January 1st, it seems, is a lovely day for starting as I intend to go on. Blog Regularly - My blogging habits are pathetic. Last year, I used the excuse that I hate photographing my projects. That's ridiculous. Sure the primping and posing is a bit much, but if I spent half as much time on blogs as I do on Pinterest, this would be a much livelier little site. 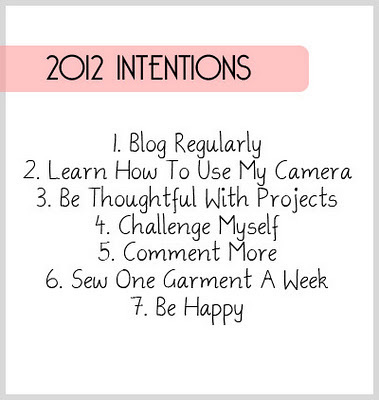 This year, I plan on blogging more, be it on my new projects or lovely style inspirations. Lame excuses need not apply. Learn How To Use My Camera - I have a new camera! Now, if only I knew how to use it properly. 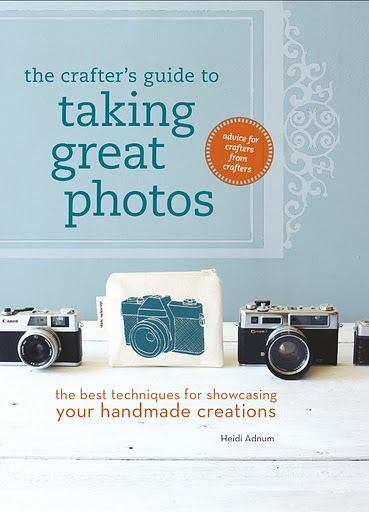 Luckily, I've bought The Crafter's Guide to Taking Great Photos by Heidi Adnum, which promises to teach me what the heck aperture means. The quality of my outfit photos should, hopefully, improve accordingly. Be Thoughtful With Projects - Since learning to sew in 2010, I've been guilty of that most cardinal of beginner sewist mistakes: not taking my time. I've tried patterns I knew wouldn't work for my body type and been a bit indiscriminate with fabric shopping. This year, I'm planning to only sew things that truly speak to my personal taste. This means more embellishments, more classic details, using mostly fabrics from my stash, and finally sewing those vintage patterns I own. Challenge Myself - There are so many dressmaking skills I'm dying to learn. This will be the year I learn them! There will be self-drafted Peter Pan collars, proper pin-tucks, and underlined lace dresses. It's time to become more academic about my sewing. Comment More - I read blogs. A lot of blogs. Unfortunately, I don't comment on that many. It's a side effect of using Google reader - it's just too easy not to click through. This year, I will let someone know when I think they're neat. Sincere compliments make the world go 'round. Sew One Garment A Week - This is a biggie. Not only do I intend to sew more, I intend to sew 52 new items this year. I can easily and happily sew for one hour each night, which means there's no point not sewing something new each week. There have been months I've sewn 7 things with no problem, then been lazy for too many weeks after. With efficiency and a steady pace, this year I will always have a project in the works. Be Happy - This covers it all, really. I want to be happier this year - with both myself and my garments. I need to get used to seeing myself in pictures, without hating 99% of the shots, and sew things that I truly love. All the other intentions play directly into this one. Hopefully, my 2012 will be even more joyful than last year, because of them. Wow! 52 sewing projects this year! I'm impressed! Can't wait to see what you come up with. 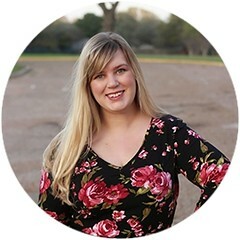 BTW have you tried following blogs via bloglovin? I prefer it to google reader. Lots of good plans, especially sewing something every week - very impressive! I'm also onboard with trying to get better at using my camera - need to frequent the library to see if I can feel more comfortable out of auto mode. I'm sure the intentions will work out brilliantly - look forward to seeing how you get on! Excellent New Year's Intentions. I also need to be more thoughtful with my sewing projects. Mine have been very slap-dash (I sound like my mother) lately and I have been unimpressed with them. I really need to take more care with my sewing/dressing. Such great intentions (I love that word). Best wishes in 2012! Those are some great goals! 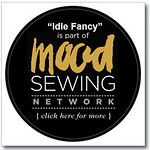 Will all your 52 projects be tied into Sew Weekly? I'd love to hear how you like The Crafter's Guide. Do you think it goes into enough depth on sewing project? Does it go into using a model or modeling yourself? I'd be interested in purchasing it if it does. I like the idea of New Year Intentions so much better than resolutions! This list of yours? Well, I think you stole it from right out of my head. Besides from the "one project a week" (this is far too optimistic for me, I know I won't live up to it-I'll settle for two weeks), all the other resolutions rang a quite big bell. I'm too lazy to even put a list like this together, so you did the job wonderfully for me! I hope all your sewing and non-sewing goals are achieved this year! Thanks, Michelle! Happy New Year!! Stevie, thanks so much for the encouragement! I'm relieved that photographing gets easier after a time - it's such a hassle for me right now. Hopefully, that will change this year! Thanks, Alana! And a Very Happy New Year to you! ApocalypseBakery, glad to know we're in the same boat! Stepping out of the auto mode really is a bit daunting, isn't it? I must say, even though it's really focused on project photography, I've found the book I linked too very helpful so far. She does a great job of talking about why certain manual settings work best in different situations. I would highly recommend it for other fashion/style/sewing bloggers struggling with their cameras. Happy New Year, Shivani! Thank you so much for the inspiration for this post. Not only do I love your style anyway, but your outlook for the new year really was a revelation for me. You rock. Hi Lily! I'm so sad to hear about the 2 month hiatus of your photographing boyfriend. I love that he is your photographer normally, however - your pictures are always so lovely & interesting. He does a fantastic job! Isn't it funny how we can get caught rushing through projects, because we're so in love with the idea of them? I find that more-than-not, if I'm not thoughtful at the outset, the end result won't live up to my expectations. I really need to remember that taking the time to do things properly will always work out in the end. It's so hard to tamp down those speed sewist impulses though! Carolyn, thank you! Best wishes for your 2012, as well! PinsAndPatience, thank you so much! I'm so relieved not to be the only one abusing Google Reader so. ;) It's so easy for reading blogs, but it really does keep one from visiting doesn't it? Happy New Year! AGoodWardrobe, I have been loving The Crafter's Guide so far. She does a wonderful job of not only breaking down the different camera functions, but also giving examples of their proper use. I can't say enough good about this book, honestly! Also, I think most of the garments will be tied into Sew Weekly, if not all. Right now, I'm really loving the SW themes on the horizon and they tie wonderfully in with garments I'd already hoped to make. Knowing myself, however, I'm sure there will be a few weeks when the themes just don't work for me. In light of my thoughtful resolution, those will most likely be the weeks I go my own way. Tina, our New Year intentions are even closer than first glance! My biggest non-sewing resolution actually has to do with my writing. Currently, my agent has my book on submission, so hopefully that goes well, but I really need to get myself into writing everyday again. Good luck on your own intentions! It's so nice to know another sewing writer! I'm inspired by your intention no.5 - comment more - to say how much I enjoyed reading this and could use every one of your intentions for myself!